The Italian born artist has an engineering background that he applied to delve into art. In “Hero Addicted”, Valentini has taken iconic covers of newspapers and magazines and reworked them weaving in a mix contemporary art, street art, and solid German expressionism. This body of work was inspired by hero and antihero; the juxtaposition of good and evil in Valentini’s three dimensional pieces is an indication that people no longer differentiate the values between the two in today’s day and age. In this exhibition the artist artfully addresses the impact that mass media and social media platforms have on society. 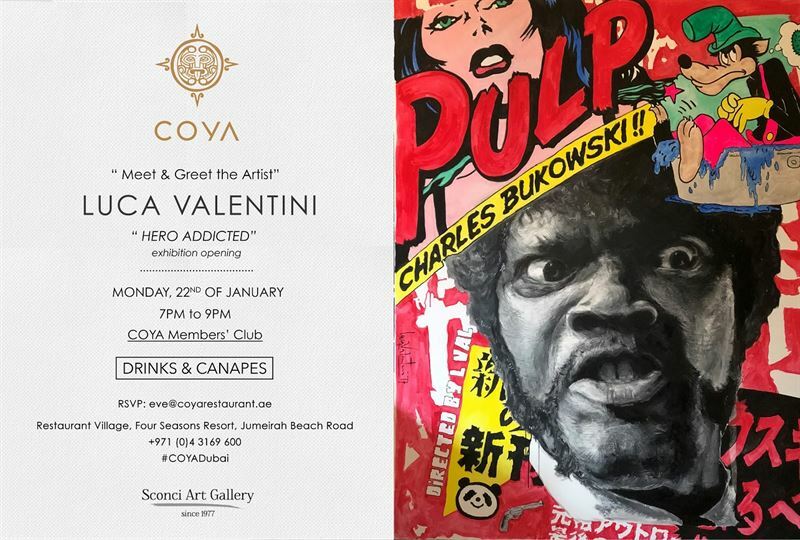 “We are thrilled to show Luca Valentini‘s Hero Addicted at COYA Dubai as our first exhibition of the year. The timing of the exhibition is especially poignant given that we are all spending more and more time on our smart phones and constantly connected to digital portals and social media. Valentini’s work is a realization that so much information is being filtered online, desensitizing us in the process. Sharing art is an important part of COYA’s culture and we’ve partnered up with Sconci’s Art Gallery out of d3 to bring the exhibition to our member’s room” said Cedric Toussaint, Director of Operations, COYA Dubai. Valentini has exhibited in Dubai, Los Angeles and Miami. “Hero Addicted” opens on January 22, 2018 from 7-9pm at the member’s room at COYA Dubai. It is shown in collaboration with Sconci Art Gallery and will be on display until March 26, 2018.